Escape the urban bustle at Nuuksio National Park and Sipoonkorven Kansallispuisto. Do your shopping at Hakaniemi Market and Liopro Finland - Handmade Souvenir. 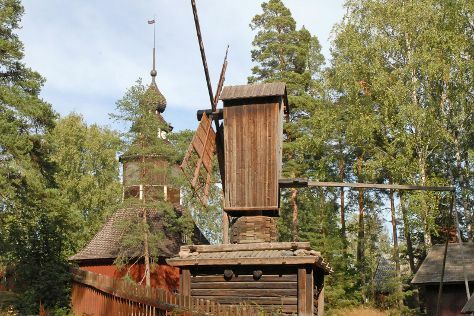 Explore Helsinki's surroundings by going to Porvoo (Porvoo Old Town, Castle Hill, & more). There's much more to do: explore the galleries of Seurasaari Island and Open-Air Museum, brush up on your military savvy at Sea Fortress Suomenlinna, pause for some serene contemplation at Helsinki Cathedral, and admire the landmark architecture of Rock Church. To find out how to plan a trip to Helsinki, use our trip itinerary maker. Detroit, USA to Helsinki is an approximately 14.5-hour flight. You can also do a combination of bus and flight; or do a combination of flight and ferry. Traveling from Detroit to Helsinki, you'll lose 7 hours due to the time zone difference. Expect little chillier temperatures when traveling from Detroit in July; daily highs in Helsinki reach 71°F and lows reach 55°F. Finish up your sightseeing early on the 21st (Sun) so you can travel back home.